Background: Ethanolic extract of G. procumbens leaves has been previously shown to possess antihyperlipidemic effects. 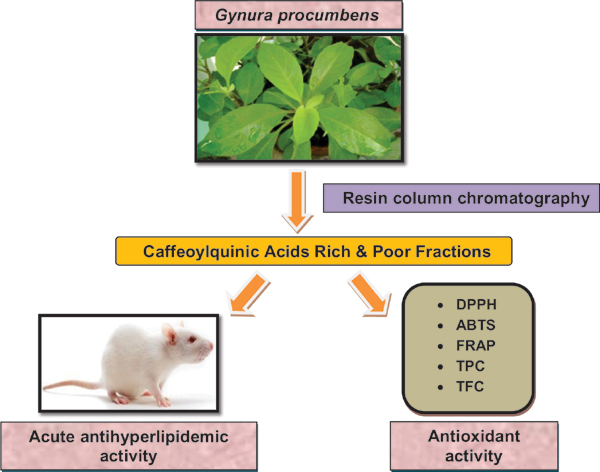 Objective: This study was designed to prepare caffeoylquinic acids rich and poor fractions of the ethanolic extract using resin column technology and compare their antihyperlipidemic and antioxidant potentials. Results: Among the treatment groups, caffeoylquinic acids rich fraction (F2) and chlorogenic acid (CA, one of the major caffeoylquinic acids) showed potent antihyperlipidemic effects, with significant reductions in total cholesterol (TC), triglycerides (TG), low-density lipoprotein-cholesterol (LDL-C), very low-density lipoprotein-cholesterol (VLDL-C), atherogenic index (AI) and coronary risk index (CRI) (p<0.01 or better) compared to the hyperlipidemic control at the 58 h. The effect was better than that of ethanolic extract. In addition, only F2 significantly increased the high-density lipoproteincholesterol (HDL-C) level (p<0.05). F2 showed better effect than CA alone (60 mg) despite the fact that it only contained 9.81 mg CA/1000 mg dose. The findings suggest that the di-caffeoylquinic acids (86.61 mg/g dose) may also in part be responsible for the potent antihyperlipidemic effect shown by the F2. Likewise, F2 showed the highest antioxidant activity. Thus, simple fractionation of ethanolic extract using the Amberlite XAD-2 resin technique had successfully enriched the caffeoylquinic acids into F2 with improved antihyperlipidemic and antioxidant capacities than that of the ethanolic extract. Conclusion: The resin separation technology may find application in caffeoylquinic acids enrichment of plant extracts for pre-clinical studies. The F2 has potential for development into phytopharmaceuticals as adjunct therapy for management of hyperlipidemia. Keywords: Gynura procumbens, caffeoylquinic acids rich fraction, resin separation, antihyperlipidemic, poloxamer-407, antioxidant. Keywords:Gynura procumbens, caffeoylquinic acids rich fraction, resin separation, antihyperlipidemic, poloxamer-407, antioxidant. Abstract:Background: Ethanolic extract of G. procumbens leaves has been previously shown to possess antihyperlipidemic effects.